This is Daniel Alexander’s original design for the London Docks. Commissioned by the House of Commons, the plan's title is at bottom left with scale bars to bottom right. An explanatory note appears in panel below the plan. 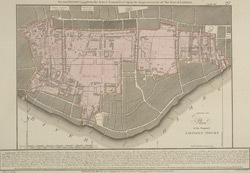 Alexander's original design included a 20-acre St. George’s Dock to the west and a seven-acre Shadwell Dock to the east. Both would have their own basins, and be linked by a small Tobacco Dock. Opened in 1805, London Docks were the nearest to the city and for 21 years all imports of tobacco, rice, wine and brandy (except those from the East and West Indies) had to unload there.